Jason Campeau stopped his dog team at Cape Nome on the Norton Sound shoreline. The clock was ticking in the world’s most famous sled dog race, but Campeau, a racer, needed a moment, he recalled recently. 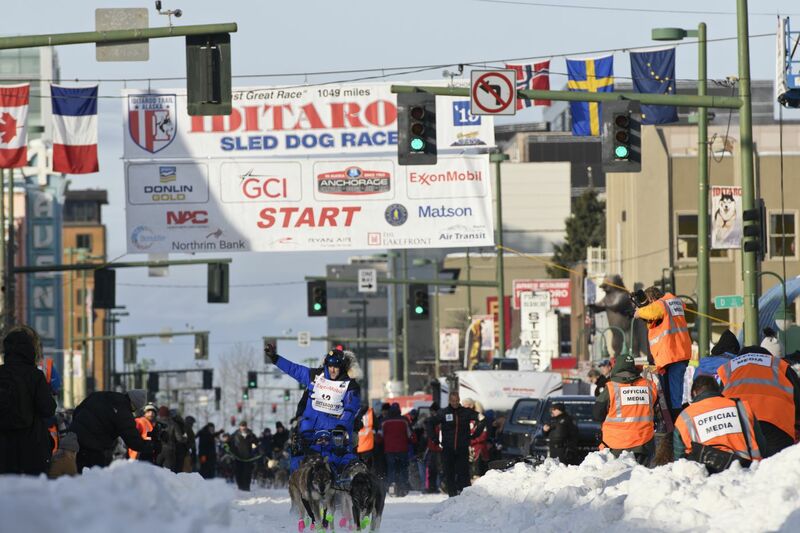 To the west, the end of the 2019 Iditarod Trail Sled Dog Race was just 10 easy miles away. Behind him was the rest of a difficult 1,000-mile trail and, beyond that, a darkness that nearly swallowed him. Campeau, 44, walked alongside the dogs that would carry him the rest of the way. One by one, he thanked them. He needed those dogs this year, and they had loved him unconditionally. He suspects they understood the significance of reaching Nome in mid-March. Two of them were with Campeau on the day he almost died mushing dogs. “I didn’t know I was going to be able to race again, and I didn’t know I’d be able to run dogs ever again,” Campeau said. It was dark and windy in February 2018 when Campeau regained consciousness near Rosebud Summit, northeast of Fairbanks, about 90 miles into the Yukon Quest International Sled Dog Race. He woke up next to his sled, his head and neck aching. His powerful dog team could have charged ahead without him as he lay seemingly lifeless on the ground. But they stayed. “Every one of them was just looking at me,” he said. Campeau, who had finished one Quest and two Iditarods in years prior, remembers the moments before his forehead hit the ice. 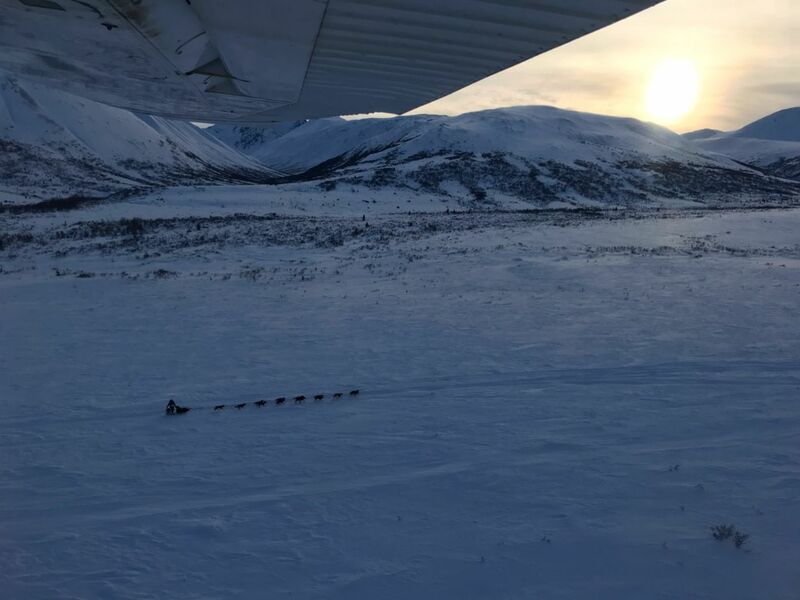 As he climbed the steep trail near the 3,640-foot summit, he noticed musher Hugh Neff and his team stopped. Neff said both he and Campeau struggled during the climb. Neff began to slide out of control down a slope, Campeau said. Instinctively, Campeau reached toward him. But as he leaned, his own team lurched in the opposite direction. It jerked him off his runners and sent him face-first into the frozen ground. Campeau thought he was knocked out for 10 minutes. Neff thought it was much less than that. From his perspective downhill, it was tough to tell what exactly had happened to Campeau, Neff said. Campeau awoke to see Neff praising one of his lead dogs. Then Campeau pointed his own leaders toward the trail and continued over the summit and through the night, not dwelling much on his fall. He’d had plenty of experience playing through pain. Jody Campeau, Jason’s brother, kennel manager and occasional handler, recalled that Jason was concerned with the health of his dogs in the checkpoints after Rosebud Summit. Jason only briefly mentioned hitting his head, he said. Jody later wondered if he could’ve done more to recognize signs of trouble, but Jason’s musher mentality made it difficult to spot. “I remember like three checkpoints later, like after an hour sleep, he downed a coffee and pounded two of those 5-hour Energy drinks and said, ‘OK, now I’m going hunting,’” Jody Campeau said, meaning Jason was going to try to catch mushers ahead of him. But the gravity of Campeau’s condition caught him from behind. A day after the accident, Jason grunted his way to the mountain pass at Eagle Summit and dropped to the ground from an exhaustion that he thought seemed extreme for his fitness level. Farther down the trail, he realized he hadn’t installed one plastic runner on his sled. Later, his running and resting schedule seemed more difficult to manage. Meanwhile, temperatures dropped from bad to brutal, dipping lower than minus-40 degrees as racers moved toward the U.S.-Canada border. 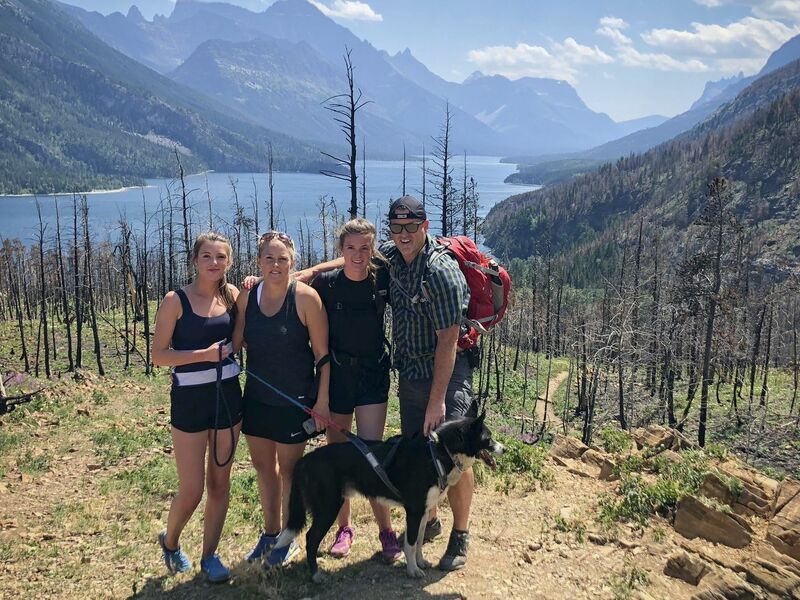 Campeau had gone about 50 miles beyond Eagle — about 300 miles beyond his Rosebud Summit mishap — when he decided to camp along the trail as it followed the Taylor Highway south of American Summit. There, “it was starting to go a little bit sideways,” Campeau said. He imagined the sound of another musher and dog team in his vicinity, only to look around and see that he was alone. Only 13 of the 26 racers who began the Quest ultimately completed it that year. None were nearby. As Campeau fed and bedded his dogs in straw, he wobbled. Then he fell over. He sat on his sled and tried to shake himself from the stupor. Campeau remembers thinking that if he blacked out again in temperatures that low, death would surely reach him before any other musher would. He pushed a help button on the GPS tracking device that all racers are required to carry. That disqualified Campeau from the contest — the Quest calls it a withdrawal — but it also alerted officials. Race marshal Doug Harris said Campeau had pushed the less urgent of the two distress signaling buttons on his tracker. Campeau then collapsed in the snow with his parka unzipped and wearing only light gloves to shield him from the dangerously cold air, he said. Later that day, Kinzea Jones, a Yukon Quest trail crew member who was part of a five-snowmachine team, encountered David Likins and his son near the Fortymile River in Interior Alaska. 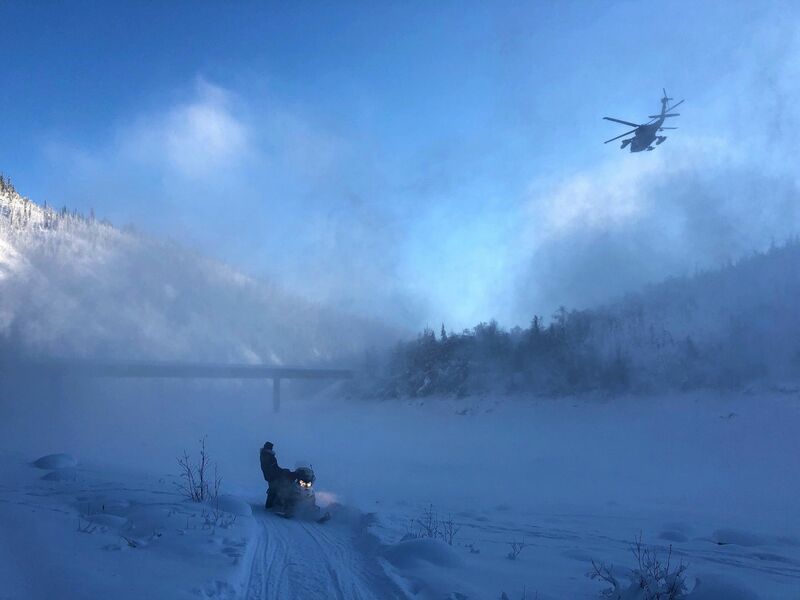 The Likinses told the crew that they had transported an injured musher to their home nearby and were in the process of retrieving his dogs, Jones said. The Likinses were alerted by email from Eagle, according to Eagle checkpoint manager Scarlett Hall. Anchorage Daily News attempts to reach the Likins family were unsuccessful. Jones, a Fairbanks-based paramedic who works on Clear Air Force Base and teaches paramedic training classes at the University of Alaska Fairbanks, followed the Likinses with her trail crew team. “It was about 55 below at this point,” Jones said. When Jones reached Campeau, she found him near the cabin’s wood stove warming under blankets after his icy clothing had been removed. Campeau was disoriented, Jones said. “I had to really bother him to get him to talk to me,” Jones said. Jones gleaned from Campeau that he had injured his head earlier in the race and that he had hallucinated before he blacked out. In satellite phone conversations, she heard a description of his punch-drunk behavior at a previous checkpoint. Jones pressed for an air evacuation right away. “For me, that’s very worrisome about a head injury. ... Really, really worried about him having some sort of brain bleed at this point,” Jones said. Meanwhile, Campeau’s wife, Jennifer Campeau, had been running a team of young dogs from the couple’s Alberta kennel in the Quest, unaware of what was happening far ahead of her. She quit her race when she was informed at the Eagle checkpoint. 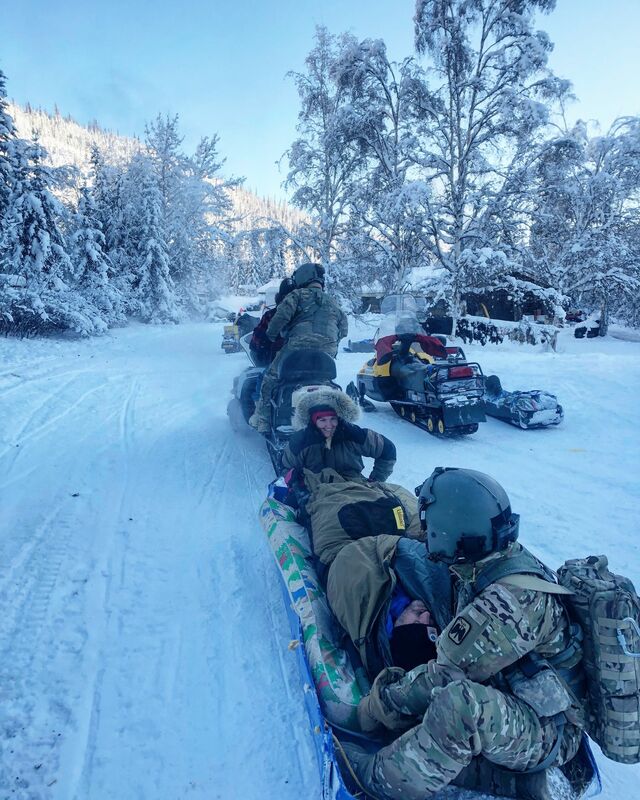 Others in Eagle volunteered to travel down the trail to help, including Fairbanks-based physician assistant Ben Turman, who was in Eagle as part of his regular visits. Turman said he was concerned that rescuers might try to move Campeau by snowmachine, which might make a bad situation worse. Krystie DePue, an Eagle resident, offered to take Turman to Campeau instead. 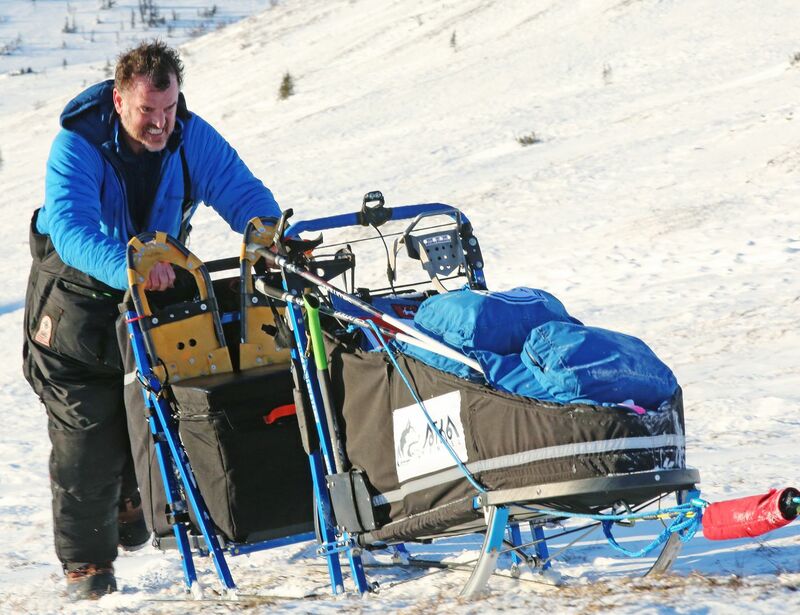 He packed a few medical supplies, and the two maneuvered around mushers, rode over the icy American Summit and rolled the snowmachine multiple times in deep snow on the frigid 90-minute journey. Once at the cabin, Turman agreed with Jones’ assessment. Jones said she coordinated with race officials, who in turn spoke with the Alaska State Troopers. The Alaska Air National Guard’s Rescue Coordination Center then requested support from the U.S. Army, according to Army Alaska spokesman John Pennell. A Fort Wainwright-based crew from the 1st Battalion, 52nd Aviation Regiment launched that evening in a UH-60 Black Hawk helicopter. Turman said several snowmachiners shined their headlights toward a landing zone on the Fortymile River. “We finally got a call at like 1 in the morning that they couldn’t find it,” Turman said. Jones said they were told a helicopter would return the next day. Campeau and 10 rescue volunteers would have to stay in Likinses’ home for the night. Turman stayed awake to monitor Campeau’s condition. In the still of the night, it struck him as peculiar, but inspiring, as he looked around the room of the remote Alaska home. “It was very amazing just to see this ragtag group of people all working together,” Turman said. Maj. William Keller, who piloted the second mission the next morning, said that the first flight failed to find Campeau because it had gone to the coordinates where the musher first pushed his help button. By the time the Army’s medic and crew chief reached Campeau and the others, it seemed to the musher that God had dispatched an army of angels to help him. “Every person that was involved in that helped save my life,” he said. Eagle checkpoint manager Scarlett Hall said the rescue might have been prevented if officials had known more about Campeau’s condition after the Rosebud incident. Campeau said he would not have continued to race if it was clear to him, and that he would never put a race ahead of other people or his dogs. Hall hopes the ordeal will lead to better communication practices in future races, and hopes mushers will be mindful of others when they’re injured. “If something happens to you ... it is not only you but your dogs and anyone else who heads out to rescue you that is at risk,” Hall wrote in a recent email. Campeau stayed overnight at Fairbanks Memorial Hospital. Later, he joined his family in Dawson, Yukon, before traveling, first to Vancouver for more examination, then home to Rocky Mountain House, Alberta, to heal from fragmented bones in his neck and two slipped discs in his spine. But while the rescue likely saved him from freezing on the Quest trail, it would be months before he began to figure out how to survive injuries that couldn’t be detected with medical scans, the ones that crippled him with anxiety, disengaged him from his family and eroded his self-worth. “I couldn’t control it,” Jason said. A concussion put Jason Campeau’s athletic future in doubt during the 2018 Yukon Quest International Sled Dog Race. His professional hockey career also ended with a concussion in 2000. Campeau was a standout center who played in Canada’s elite junior ranks. His overtime goal once put his Ontario Hockey League team into the championship tournament against Canada’s other best junior teams. The NHL’s Toronto Maple Leafs invited him to join its training camp in 1995. That year, he pulled a Leafs sweater over his head for a preseason exhibition game against the Florida Panthers. A full house watched as he scored one goal and assisted another, said Jason’s brother Jody, who was there. In that game’s third period, though, Jason tore ligaments in his knee, an injury he said ultimately resulted in his return to the juniors. “He never really got another sniff again with the Leafs,” Jody Campeau said, noting Jason never complained about it. Campeau did play professionally in lower leagues after a national championship-winning college career with the University of New Brunswick. Injuries were part of the price players paid to keep hockey goals alive. “We would fight, take your helmet off and fight. You’re punching each other straight square in the face,” Campeau said. "I’ve played playoff games with dislocated shoulders and broken bones. I played a year with two broken bones in my finger. “That was the mentality of that sport. ... You’d be afraid to say you were hurt or injured, because if you did, it could end your career,” he said. There were few conversations then about the chronic effects of blows to the head. That conversation is more common now, fueled by the deaths of professional athletes found to have been affected by chronic traumatic encephalopathy. CTE, which can be confirmed only by autopsy, is now being studied to understand its connection with dementia, behavioral changes, depression and suicide. But in Campeau’s playing days, which spanned 21 years, there was less awareness about recovery from concussions. “I had six concussions that I know of,” he said. One came while he was playing in a British hockey league, when an opposing player took a baseball-style swing at his head. The following year, he was hit from behind and knocked out while playing for a team in Shreveport, Louisiana. Though Campeau’s most recent concussion came under different circumstances, he’s sharing details of his situation in hopes that it might help someone recognize persistent post-concussion syndrome, a condition in which symptoms of concussions last several months and can impair cognitive abilities and social interactions. Back in Alberta after the 2018 Yukon Quest, Campeau struggled with pain in his neck and coped without prescription pain medication, he said. But the mental state was the scariest part, he said. His anxiety would spike at the thought of driving or going places with activity and commotion. Staying home gave him no peace either. Campeau couldn’t concentrate. He often sat staring blankly out of windows, nearly drooling, he said. “It’s like all the fun, all the joy, is wiped out of him,” Jennifer said. The grip of anxiety, depression and physical pain took a toll on Jason’s self-esteem, too, especially as he saw how he was affecting wife and teenage twins, Jessica and Mackenzie. “My daughters saw a dad that was vegetable, and my wife saw a husband that was useless,” he said. Jennifer did her best to think positively enough for both of them, but it was hard not to wonder if this was her family’s new normal. Jody Campeau did what he could to help his brother, whom he calls his lifelong best friend. The two are partners in a business consulting company. “It’s tough. You tell a person you love him. You try and show them,” Jody said. Neurologists assessed him in the autumn. While he waited months for those appointments, he turned to the internet for answers about why he felt the way he did. He also reached out to hockey players who had suffered concussions. What he learned about the effect of concussions inspired him to set small goals each day. In July, Jennifer noticed a shift. Jason began to spend time with his dogs, even if it meant he had to take a nap afterward. Small steps meant forward progress, and that changed a lot. That’s the takeaway Jason, Jennifer and Jody Campeau hope to share with anyone in a similar state. Dr. Martin Mrazik, a clinical neuropsychologist and a University of Alberta associate professor who treated Campeau, said Campeau’s willingness to talk about his struggles aided his recovery. Mrazik, who works as a consultant to the NHL’s Edmonton Oilers, said that’s often counterintuitive for athletes. “I think he’s a great example of what other athletes in his position should do. ... Reach out. Talk to people. Don’t just think that you have to handle it alone,” Mrazik said. Campeau signed up to run the 2019 Iditarod on the first day it was possible. At the time, it seemed like a long shot, he said, but it was a goal that kept him moving in the right direction. “Besides my family, the biggest help I received to truly start healing was the affection and love I would receive from my dogs,” Campeau later wrote on his kennel’s Facebook page. In time, small tasks led to 50- and 60-mile training runs. Doctors couldn’t sign off entirely on the risk of running the Iditarod, Jason said, but they didn’t argue with the positive impact the goal had on his mental well-being. Jennifer had mixed feelings about her husband’s return to distance racing, fearing his body might not be ready for the strain. She also worried that lack of sleep could plunge him back into the mental mire. But she also knew it would be difficult to change his mind. Jennifer was grateful that Jason’s father and brother planned to fly from checkpoint to checkpoint on the trail this year to monitor Jason’s progress. “I wouldn’t have missed it for the world. His comeback was remarkable, and I would’ve given my left nut to be there,” Jody Campeau said. On March 2, Jason Campeau clicked into a black snowboarding helmet, and he and his dog team ran the Iditarod’s ceremonial route through Anchorage. 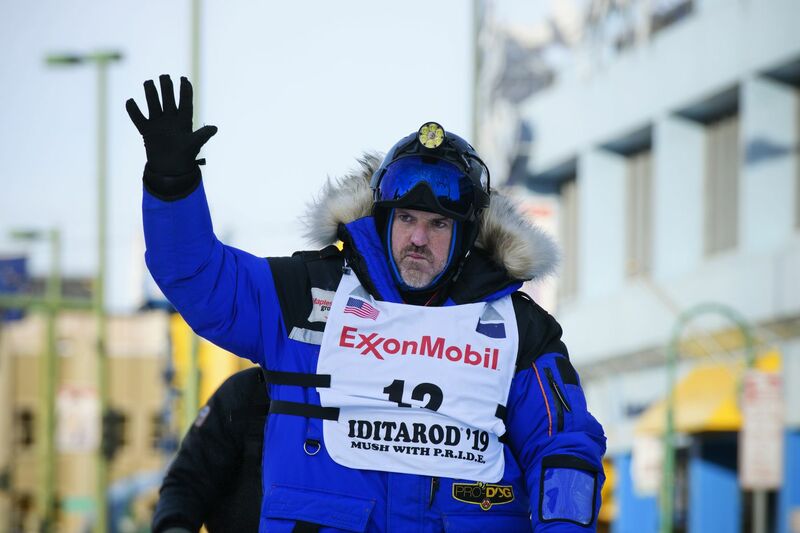 He wore the helmet most of the race, he said, on an Iditarod Trail that proved particularly difficult for the whole field of mushers. The helmet was an added safety measure that doctors strongly advised, but it couldn’t deflect the fear and stress stoked by the Dalzell Gorge and Farewell Burn. “Do not talk to me about my time on my run finishing the Gorge,” Jody Campeau recalled Jason telling him. “I admit it. I got really scared,” Jason said. But as the race progressed, Jody thought his brother, somehow, seemed capable of even more adversity than life had already thrown at him. In a phone call to Jennifer, Jody said he reported, “The dogs couldn’t keep up with Jason’s mental state." In Shageluk, with about half of the race’s miles behind him, Jason confidently bootied his team and tended to his sled by headlamp. “We’re here and we’re still around,” he said before departing on the Innoko River under a star-filled sky at midnight. On the sea ice outside of Nome, in the Iditarod’s final miles, Jody watched as the light of his brother’s headlamp drew closer at dusk. He took a blurry picture of the sight and texted it to several of Jason’s friends, family members and former hockey teammates. Then he called their mother. When the team approached, Jody ran in front of the dogs as the trail climbed off the ice and onto Front Street, then ran alongside his brother’s sled for 2 miles with tears in his eyes. No crowds lined Front Street to watch as Campeau and his team crossed the finish line in 30th place, about 2 days and 18 hours after Pete Kaiser won the race. Few were there to watch as the Campeau brothers hugged at the finish line for what Jody said seemed like minutes. But Jody said he’ll carry that memory for the rest of his life. “That can never be replaced,” he said. Jennifer said there are surely more challenges to come. She said she never cared where Jason placed in the Iditarod. He finished it and he enjoyed doing it, and that felt like a victory. “Oh, I was so proud of him,” she said. Weeks later back at his Alberta ranch, Jason talked about making spring break plans with his daughters. For them, he hopes his example this year will speak louder than his words ever could. “There was no way I was not finishing that race,” he said.